American Auto Rental is an independently owned and operated franchise of the Sensible Car Rental nationwide network. Founded in 2007, this family owned and operated franchise was established as an extension of our effort to provide full customer service to our patrons. 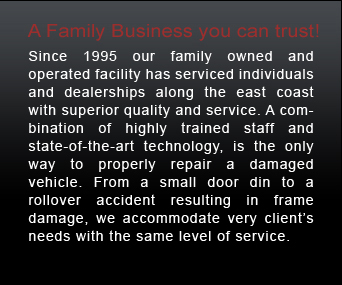 We understand the aggravation you and your family go through, not having a vehicle while yours is being repaired. We have rental vehicles on the premises and can bill the insurance company directly. In most cases our rates are in accordance with your insurance company allowances. If you choose to use Enterprise or Hertz we can arrange pickup from the shop. Hours of operation: Mon-Fri: 8:30 a.m. to 4:30 p.m. Method of Payment: Visa / MasterCard accepted.